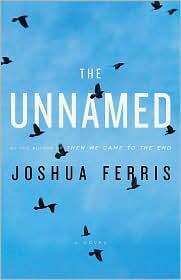 It's impossible for me not to draw comparisons between Joshua Ferris' first novel, Then We Came To The End, and his second, The Unnamed. They struck me as so similar it's almost as if The Unnamed is a slimmed down, repackaged “End,” which means the two novels share the same attributes and drawbacks. Unfortunately, The Unnamed has far more of the latter and not enough of the former. In The Unnamed, Tim Farnsworth is stricken with a strange affliction; with no apparent trigger, he's suddenly overcome with an unstoppable urge to walk. Nothing, not his job, family concerns or inclement weather, can dissuade him. He has to walk until he passes out from exhaustion. As doctors and psychologists point fingers over their failure to find a cure, the illness takes its toll on Tim's career as a big-shot lawyer and strains his already fragile family life. As in his debut novel, Ferris relates this story in an especially distant third person. Such an approach worked well in “End.” That book had a large cast of characters and the removed sense of almost anthropological observation made a familiar setting ? the workplace ? seem like a museum diorama, worthy of fresh scrutiny and close study. The Unnamed tries to be much more intimate, but can't succeed. At its heart it's really only about three characters ? Tim, his wife, Jane, and their daughter, Becka. Thus, Ferris' narrative detachment alienates the reader from the characters. Jane does this, Jane does that, but her weariness and frustration are never familiar. The figures move through their choreography, but they're merely striking poses. There's no intimacy to be had here at all. The plot in is really too thin to be spun out to novel length. The domestic front takes precedence, but Ferris has added a subplot about Tim's career. It's such a soggy attempt ? like John Grisham's attempt at a weepy ? that it feels like filler. Ferris also begins almost every chapter with a paragraph or two about the weather. This device is used so unsparingly it feels mechanical, like Ferris wants to add atmosphere but doesn't know how other than to try an almost medicinal approach to curing the novel’s dryness. And lastly, in a world where cancer, Alzheimer's, and Hodgkins have yet to find definitive cures, it's a little hard to muster up too much sympathy for someone whose plight is the irresistible impulse to walk. Ferries tries, but he cannot make it heartrending. All in all, The Unnamed strays more towards the “dud” side of the spectrum. I can picture Ferris and his editor trying to capitalize on the success of “End” by administering Ferris' approach in that novel to one of Ferris' favorite unfinished short stories and then hacking away at it, trying to cover their tracks. It didn't work. “I can picture Ferris and his editor trying to capitalize on the success of ?End? by administering Ferris? approach in that novel to one of Ferris? favorite unfinished short stories and then hacking away at it, trying to cover their tracks. It didn?t work.” I couldn’t agree more. I really didn’t like this book. I thought Ferris had way too much going on and he didn’t invest any time with any of it. Which didn’t let me care about Tim or Jane or anyone else. This book was three drafts away from being a good one. I’ve read a lot of praise heavy reviews of The Unnamed, but I don’t understand any of them. I’m glad to see that I’m not the only one who couldn’t get on board. I was just surprised at how much I could see the clockwork. It was so nakedly worked-on I wondered where the finesse was.